Code no CT089KI: Cards like this circulated in the upper Valley in the early 1900s. 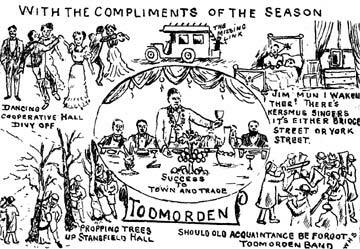 The messages were not all festive - notably the one relating to Todmorden buses! I well remember my first Christmas at Mytholmroyd in 1956. As "new man" I had some difficulty sorting letters into the right slots: it was alright when there was a house number but sometimes there was just a name and a street and I could be in big trouble. One in particular caused no end of problems. There seemed to be a Greenwood at every other house on Erringden Road - the Calder Valley was, and still is, full of `em, God bless them all! The cards I was unable to sort were put to one side. Slowly, but surely, the pile grew until it was almost a foot high. I admitted defeat and turned to the Postmaster for help. He put Hector Garlick - who knew everyone - on the job with me and he set to work with a will. Hector carefully pulled out the cards, rarely sealed, and just by reading the names could tell straight away who they were intended for. His comments as he did this were mind-blowing: he seemed to know everything about recipient and sender, sometimes tutting, sometimes laughing out loud - a few times with a tear in his eye. That pile of unsorted mail went down like magic and off the cards went to the right addresses. My customers must have thought what a clever boy their new young postman was!